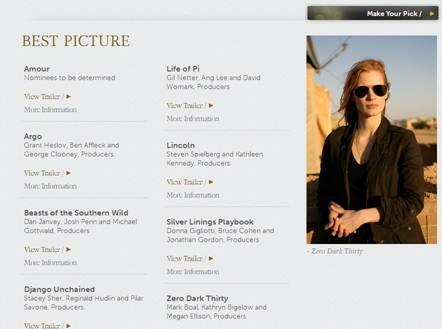 The Oscar nominations are out – socially enabled of course! Happy Thursday – the Oscar nominations are out! My Twitter feed has gone crazy with the news that the Oscar’s nominations are out. And whether you agree with the finalists or are bitterly disappointed to see a lack of potential gongs for The Hobbit, Skyfall or the Dark knight Rises (no nominations), there’s a neat social feature on the site which caught my eye. Firstly, the main nominee list can be easily shared using the social media buttons – this is a complete given for me. All content should be easy to share. On the ‘Make Your Pick’ page (predict the winners and challenge your friends), you’re asked to log into your Facebook account to play the app. The user makes their predictions by selecting a nominee for each category. They then turn “On” Play with Friends to connect with their Facebook friends who have also turned on this feature. User can also share their ballot to invite more friends into the game. On the night of the event users can track their picks and their scores will update live during the show (a good competitive feature). The app has been sponsored by the University of Phoenix – which I should imagine will give them tons of exposure as an advertisers and the Oscar’s enough cash to fund the app, and more. A brilliant way to engage people in the awards from 6 weeks out, build up viral buzz about the Oscars, and make them feel part of the awards during the show whether they’re there or not. ← What could Google Glass mean for the events industry? Wearable augmented reality on the show floor….